November 25, 2014 in Uncategorized | Tags: christmas, family, home | Enter your password to view comments. Ahhh it is good to be home. I'm in danger of completing my transformation into little Rhian, I've discovered. 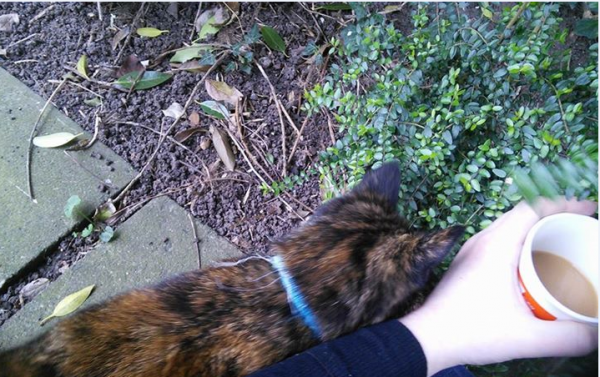 I was sat in the garden, 'helping' my mum plant flowers by sitting next to her chatting, while drinking tea. Then a couple of cats from next door came to visit! Instead of bidding them a cordial good afternoon as I'd have done before, I stroked them for ages and one of them (a female cat, quite possibly by the name of Julian – no, really, one of the cats next door has indeed been named after my dad) bumped her little head against my knee lots and lots. I don't think I could ever own cats because I grew up vegetarian, and the idea of buying meat or fish, even if not for me, feels wrong, but maybe I could visit them and they would be affectionate and awwwwww such cute. Apart from going AWWWWW I've been mostly hiding from my family, exploring town (which seems to have changed LOADS in 4 months) and feeling short, since all five of my younger siblings are taller than me, which seems unfair. PIZZA IS SOON. I have an awful confession to make. You may judge me for this. But prior to today, I had never once visited the Alnwick Garden. It is not far from my abode and I love gardening, so how has this happened? The truth is, I did not want to spend £20-odd on looking at some flowers when I have ones that I have hand-reared myself on my own balcony. This is a skinflint approach, but today the admission price was a mere £2 for residents thanks to the epic resident's weekend where Northumbrians (or adopted Northumbrian residents in my case) get to go to all the nice places in the area for cheaper than what they would normally do like. I'm not really planning to cash in on any more activities because I have now done everything in Alnwick but cannot be bothered to leave town tomorrow meaning that it will be my fault when I start becoming even more insular and weird and referring to people I encounter on the street who I don't recognise as 'outsiders'. But there are numerous practical problems with getting a chinchilla, so now the serotonin levels in my brain are a bit lower, I'm thinking possibly of putting it towards a holiday (it's not enough to go to Iceland, but perhaps Ireland? Perhaps in the autumn? Who knows? ), or spending part of it on a new laptop battery, part of it on charities and the rest on my plot to get a mortgage. Sigh. This is all less exciting than a chinchilla. Issued to all British sailors during the war! I had a long conversation with the bookshop lady about how exciting it all was. She assumed I was buying it for a bloke, but I corrected her. 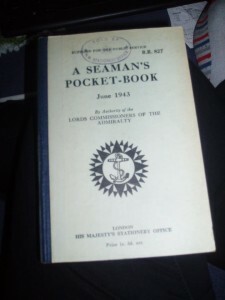 I was slightly disturbed to find out from my dad that the bookshop in question might be closing- I hope it's just a rumour, because it's a great bookshop full of interesting things like this.I will treasure this book and hopefully use it for further nautical translations at work, if I'm allowed. 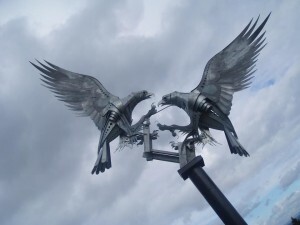 It's a new statue of some buzzards that's divided opinion in Malvern. I really like it, but can see how not everyone would. I'm glad I'm coming back to Malvern again later this month, for I do miss it a bit when I'm away, even though I also like Alnwick. We currently have a French exchange child staying with us, so it's nice to see Malvern through the eyes of a visitor. I'm a bit concerned about her because I imagine it's overwhelming to be thrust into a family of foreign well-meaning lunatics like mine. Last night we took her to the theatre to watch an awful Irish music show. Parts of it were bearable but much of it was quite sentimental and involved much clapping along from the audience. Tonight we are to eat Chinese food. After this, I shall consider packing for the 6-hour journey back to the frozen north. The high point of my week was probably the revelation of Command Strips, which allow me to put up pictures in my rented house without hammering nails through the wall, invoking the wrath of my landlady. I put up my new seascape picture and a couple of hooks, so that I'll no longer be chucking my coat wantonly on the floor when I traipse in from work. I am going to see if I can find any more pictures in the charity shops this weekend. I'm also considering investing in velcro strips to attach my throw to the settee, because it keeps falling off. I cannot explain how good it is that for the moment, my biggest concern is the fact that my throw occasionally falls off my settee. Obviously I wouldn't like this to remain my biggest concern for the rest of my life- smooth seas never made a skilled sailor, and all that- but for now, and after all the mad stress and lunacy of the past 12 months or so, I'm revelling in my own mediocrity. I'm working on distinguishing between a Geordie accent and an Alnwick one, and I think I'm pretty much there, although as a southerner, I have much work to do. I used the plural 'you' today, though, which I think is progress. I'm spending my Friday evening doing long-term financial planning, because obviously my obsession with Command Strips wasn't enough to terrify myself into believing I'm an adult now. It'll be a while till I can afford to go back to university and study dialectology, aka, The Dream. I am constantly shocked at how I have yet to make my fortune in the translation industry, like all those other millionaire translators. Another part of The Dream involves perhaps moving to Wales one day, because I was reminded of the great beauty of (parts of) Wales as I obsessively explored the world using Google Street View. I even have an album of Interesting Things I've Found Using Google Street View, but I'll only show people if I REALLY want to bore them. Now I am going to gaze at my boiler with great suspicion, because it keeps breaking and I must reset it, which does not bode well given the massive quantities of snow in the outside world. I blog from my very cold bedroom at home, because my mum's still refusing to turn the heating on because it's 'only October 14th'. Sometimes there are disadvantages to having a northerner for a mother, although on the plus side, I have learnt to deflect anything remotely resembling sentimentality with humour, so it all balances out. Iceblocks for hands aside, it's nice being at home, and being in a house where some of the rooms are bigger than my whole flat in Buckinghamshire. I've been sent to make tea for the clan as my mum wittily remarked that I would no longer be used to walking such long distances inside. O how I am mocked. It was another pleasant weekend though. I'm always worried that it might not be worth coming back home just for the weekend, what with the EPIC JOURNEY each way, but it always is. Spent much of yesterday on the train with the smallest of my sisters (the only one of my siblings who's still shorter than me, but then, she has the excuse of being 11 years old), trying to overcome the various train cancellations in order to get her to a concert rehearsal over in Pershore. Then we had a nice lunch- me, my mum, two sisters and my nan- and I went back to Worcester and to THE HIVE. I'm now desperately trying to finish Conn Iggulden's (very good) book "The Conqueror" before I leave at 5pm, because I don't want to be lugging it back to Buckinghamshire with me, as I have the traditional 4 mile walk from my house to the station to be looking forward to. I'm about halfway through. 250ish more pages. In further, equally groundbreaking news, I THINK I can drink cider again without any terrible results. Obviously I'm still a lightweight, but I'm at peace with that now. I can't wait for my next visit home. Hopefully I can take a couple of days off to make it into a Long Weekend again. It would be Nice. YES. I took the train via Slough in the end. The advantages of this are that I do not have to change trains at ALL, whereas if I went the Chiltern route, it'd be 4 times. Disadvantage being that I cannot go via Slough on a typical weekend home, because indeed, I need to get the bus from Slough to my Buckinghamshire shack on my return, and said bus does not run on Sundays, thus risking the very real possibility of me having to stay in Slough overnight before restarting the working week. And nobody should have to go through that. But this time I shall be returning on a MONDAY. Thus bus. The WORST bit of the journey was at Evesham (home of my Illustrious Nan), when several scantily-clad vodka-drinking teenagers got on the train, shouting "IS THIS THE QUAAART CARRIAGE?" By QUAAART they meant quiet, but they were not enunciating very clearly at all. Also I was reading a dialectology book at the tiime, so that it why I especially remembered their pronounciation. THEY DID NOT SHUT UP. Oh, do not look at me like that, reader. "Ooooh Katie, you've done two paragraphs about train lines and their pros and cons, and also about some young people who annoyed you, is it possible that you are actually 88?" YES IT IS. 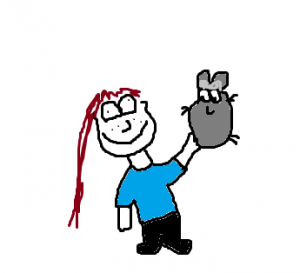 It is my blog and I shall moan however much I wish. Anyway, Go Ape-ing is tomorrow. Today I'm going to try and learn the second half of this so I've got something to put on my Other, Tin Whistling Blog. YOU ARE IN FOR SUCH A TREAT #lies. Yes, the much-anticipated LONG WEEKEND has come. Or will be, after tomorrow. Apart from swinging through trees with only loads of safety equipment to protect me, I also plan to spend some VOUCHERS I got from work. If I'd have been given cash, I'd have found it easy to spend, for I love cake. But these vouchers force me to think outside my cakey box. When I got the Christmas vouchers, I went to Wilkinsons (took two trips, in fact- one back home, and one in Wycombe) and bought two bins, a toilet brush, some socks, some batteries, hair dye and a coffee pot and also sweets. This is excellent value for money. I might go again although I can't think of what to buy. I'd like to get home improvements of some kind so that my flat looks less like a nightmarish vision and more like a place I could invite people to without feeling utterly humiliated about my living circumstances, but I don't think these vouchers will provide the solution to all my problems. Might save them, actually, until I have a nicer flat. "Nicer flat" here means "Any other dwelling in the UK, more or less". I'm a bit of an obsessive planner and I'm not very good at being spontaneous, but on Wednesday I decided to go home for the weekend (yes, I know that's still planning 2 days in advance, but…well, it still counts as spontaneous to me). My reasons were fairly unsentimental- my laptop needs a new hard disk, because currently, everything I come into contact with breaks, and it's under warranty at home, and a £30 train ticket is cheaper than the £110ish that they'd charge to repair it in the south-east. But it's really nice being at home. I've spent the day updating my scrapbook, going into town (seeing 6 people I knew, because that's how my town is), drinking coffee, writing down recipes, and tormenting my youngest sister. It's nice. It's a bit sad that I can't stay longer, and that when I come home for the weekend, I kind of have to make the choice between spending time with my family, or seeing my friends- I can't have both. And of course, next Sunday will be the second in a row that I spend feeling a bit desolate about leaving somewhere that I don't really want to leave. Still, it's good to be somewhere where there's hot water. I'm told my flat will have hot water soon, and there's been talk (after much polite badgering from me) of reducing the rent for the period (2 weeks today!) in which there was no hot water. I feel obscurely guilty, even though I've got nothing to feel bad about because I pay for hot water (and a fridge, but I'm not getting into the fridge/freezer saga here, because it's boring for everyone to read about). It's really been getting me down (in case you hadn't guessed), all these problems in the flat. I've thought about moving, but the problem is, if I moved, I'd have trouble finding somewhere so cheap (even though to me, it's not cheap anyway) in my village, so I'd have to move somewhere close by, like SLOUGH, which would mean registering with a new GP, and generally loads of kerfuffle, just when I'd got settled somewhere. And if I was going to move house, I'd rather it be somewhere I wanted to move to, which would maybe not be the south-east.